Ok, so to start I’ve got an admission to make – I’ve never watched an episode of SpongeBob SquarePants, strangely until today I thought he was a car sponge but in the back of my mind I had a block of Swiss cheese (being honest – no judgements please). Not having kids of the right age and having never watched Nickleodeon the Spongebob phenomena passed me by – until now. 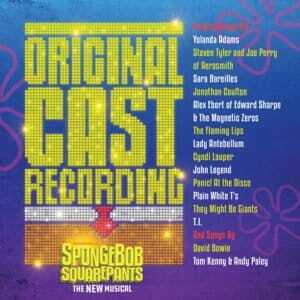 SpongeBob SquarePants the musical has just started previewing on Broadway. As if a musical based on a cartoon sponge were not a big enough handicap for a multi-million dollar musical, this score is written not by one composer but through contributions from some fifteen songwriters and a diverse bunch they are too! The composer/lyricists include Yolanda Adams, Steven Tyler and Joe Perry of Aerosmith, Sara Bareilles, Jonathan Coulton, Alex Ebert of Edward Sharpe & The Magnetic Zeros, The Flaming Lips, Lady Antebellum, Cyndi Lauper, John Legend, Panic! At the Disco, Plain White T’s, They Might Be Giants, and T.I., and songs by David Bowie, Tom Kenny & Andy Paley, with additional lyrics by Jonathan Coulton and additional music by Tom Kitt. Apparently each was given a specific moment in the show to write for with as much information as possible to guide them. That list of writers and the subject matter alone will probably have Broadway purists heading for the exits, but you know what? It works! There is no doubt in my mind that the reason this score works is down to the incredible talent that is Tom Kitt. Many will know him as the composer behind Next To Normal, High Fidelity, Bring It On and If/Then, but he blew me away when he took Green Day’s American Idiot and brought it to the stage. When you listen to this recording you would never know it’s the result of such a musical melting pot. It’s cohesive, exciting and most of all great fun. No spoilers on the plot but crisis looms and a hero is needed, I’m sure you get the drift. There are some wonderful performances from Ethan Slater as SpongeBob, Danny Skinner as Patrick, the wonderful Gavin Lee as Squidward and Lilli Cooper as Sandy Cheeks. The score is infectious, I dare you not to find yourself humming the tunes without realising. I know I certainly have. My favourite include the stonking opening number Bikini Bottom Day, BFF, Daddy Knows Best, Hero Is My Middle Name, Daddy Knows Best and I’m Not A Loser. There are loads of levels here, certainly enough for the kids to have a riot of a time whilst keeping the adults more than amused. Director Tina Landau calls Bikini Bottom ‘a kooky kaleidoscopic world’ and based on this recording it’s a world that I would certainly like to visit. You certainly don’t need to know anything about the cartoon series, I didn’t. Let SpongeBob work its magic on you! 13 June 2019 - On Your Feet!